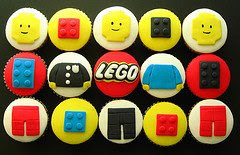 I had to post these cool Lego cupcakes for all of my Lego-obsessed nephews and their (Lego-obsessed Dads) one of them just had a Lego birthday, I think. 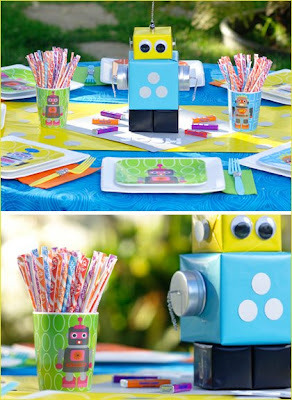 which go perfectly with this great robot party from the Hostess blog. My son would LOVE this! Should we do this after the space party or after the pirate party? I think he’s going to have to start having two birthdays a year to do it all. Guess that’s why I stick to buying them, huh? 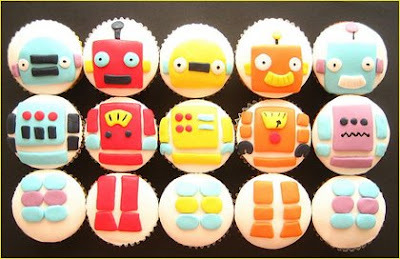 Oh those cupcakes are adorable! love these ideas…you’re starting to get my brain flowing for jake’s birthday…he’d loving lego’s, robots (wal-e) and pirates! haha!